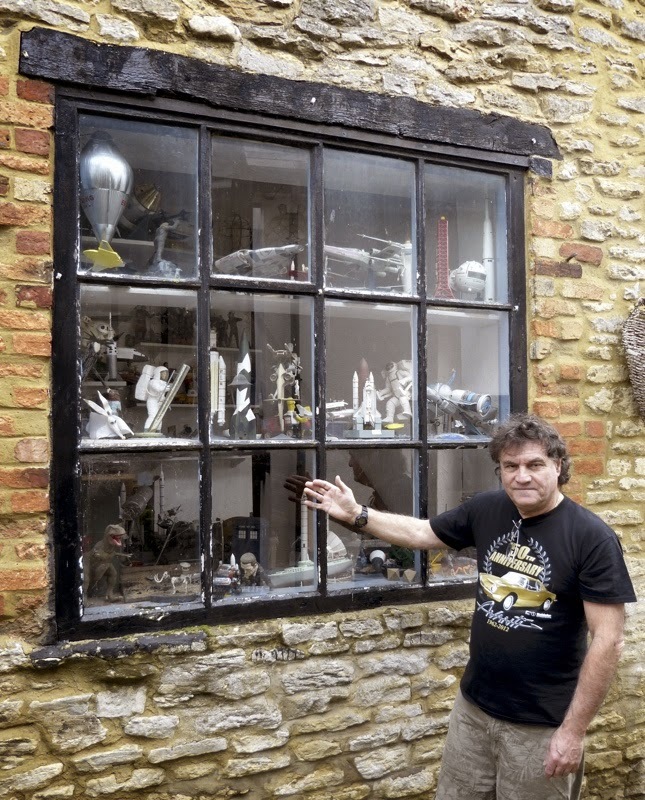 WE TOOK A LOOK through the window of Mat Irvine's 'Marvellous Model Museum' recently, and here are just a few of the pre-Christmas miniatures we saw there. Here's a 1:25 scale Ford Thunderbird (below) a retro-future automobile that was produced in full-size form from 2002-2005. The model itself reflects the rounded, even somewhat portly lines of the original, with an excellent rendering of the egg-crate grille. Below, the T-Bird is joined by another Ford, the Falcon. Read more about the retro T-Bird at SMN here. Into the air (above, below) with a 1:96 scale rendering of the famed Italian Savoia-Marchetti SM-55 twin-hull flying boat, one of a fleet that was flown across the Atlantic in the 1930s, under the command of Italo Balbo. It's a neat model, with a splendid stand, finished off nicely by Mat's nautical-look paint job. Read more on the SM-55 at SMN here. Radioactive death stands at the ready (below) with a 1:144 scale kit based on the missiles of the Cold War era. The US arsenal stands at left, matched by the heavyweight designs of the Soviet Union. More missiles at SMN here. Here's a peacetime theme (below) in the form of a cute 1:24 scale 'Depth Charger' custom car. It's a pity that the water level shown in the porthole matches the angle of the vehicle, rather than that of the ground, though. Custom cars at SMN here. This is a 1:32 scale model of the McDonnell XV-1 Convertiplane (above, below) a full-size design that came complete with pusher-prop, wings, and rotors. However, it's not likely that any real ground crew had big holes in their backs. For that issue, we can blame plastic moulding problems. Last but not least, a 1:25 scale Revell-Germany model of a TV-style CSI detective breaks cover, with a GM Hummer parked behind him. Cool or what?! SMN article here.